The theme over at IHCC this week is Party Treats...and we are using Nigella Lawson recipes as our guide! Many of you know that I have been insanely busy working since college football began...and probably will continue to be until the last (bowl!?) game is played. I am trying to come around visiting as much as possible, but please excuse me if I seem absent or sporadic over the next couple of months. Sometimes I have to click, drool and move on to the next tasty spot in a speedy fashion. Although my boys are the MSU Spartans (go State! ), I work for ND Fighting Irish and hope that they do well...because it means that our whole city does well...and I can continue to pay my bills. Except that they are going down this coming Saturday when the Spartans charge into town!!! I knew I wanted to make a quick Tailgating at home -slash- Game Snack and I found 2 such recipes from Nigella. I am pretty much addicted to nuts. I like popcorn. So, nuts and popcorn it is! They're both quick & easy enough that I can rush home and whip some up between the end of a shift...and the beginning of a game...about 1/2 hour, usually. 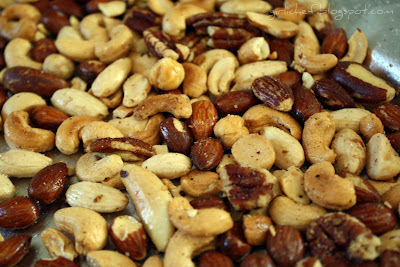 Preheat oven to 350 degrees F. Toss the nuts (if bought separately) and spread out on a large baking sheet. Toast in the oven till they become light golden brown, about 10 minutes. 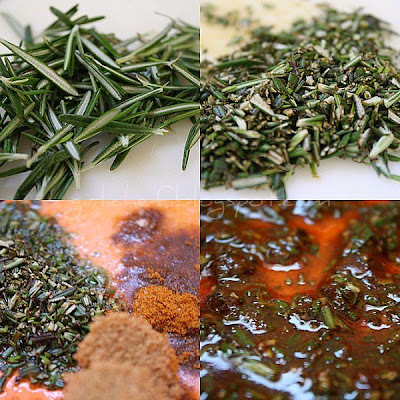 In a large bowl, combine the rosemary, cayenne, sugar, salt and melted butter. I happened to have a can of assorted mixed nuts, but they were salted...so I just cut back on the amount of salt I added in the mix...just a couple small pinches. Put the oil into the biggest pan you have with a lid over high heat, add the popcorn, and quickly put on the lid. Let the popcorn pop, shaking the pan every now and then to keep the kernels moving. You will hear it, but don't be tempted to look, unless you want to get shot at tee hee, and once it has stopped popping, take it off the heat. Or simply put it in your microwave popper...probably in two steps because it only holds up to half a cup...and pop it without the added oil. Melt the butter with the spices, in another pan or microwave that too add salt and sugar and pour it over the popcorn. Put everything into a large paper shopping bag. Fold the top over to hold in the popcorn ...or toss in huge bowl covered with a large plate and held tight! Shake until popcorn is thoroughly coated with spicy butter. Serve. Serve nice and pretty...or throw in bowls, grab a cold beer and turn on the game! If you've created one of Nigella's recipes in a Party fashion this week...or could make it relate somehow, please join us at I Heart Cooking Clubs and add a link to your post! The more people at the party, the merrier! And while you're there...check out the theme for next week. I also wanted to take a minute to say !!!YIPPEE!!! girlichef is today's Foodista Featured Blog of the Day! Click on the button if you'd like to check it out! Many thanks to Foodista for this awesome recognition. Nice, easy recipes are perfect. I have tried the Union Square Bar Nuts before and they are awesome. The popcorn looks really good too. Congrats on being the featured Blog of the Day! 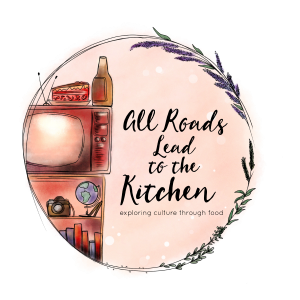 Congratulations on being featured foodie today! 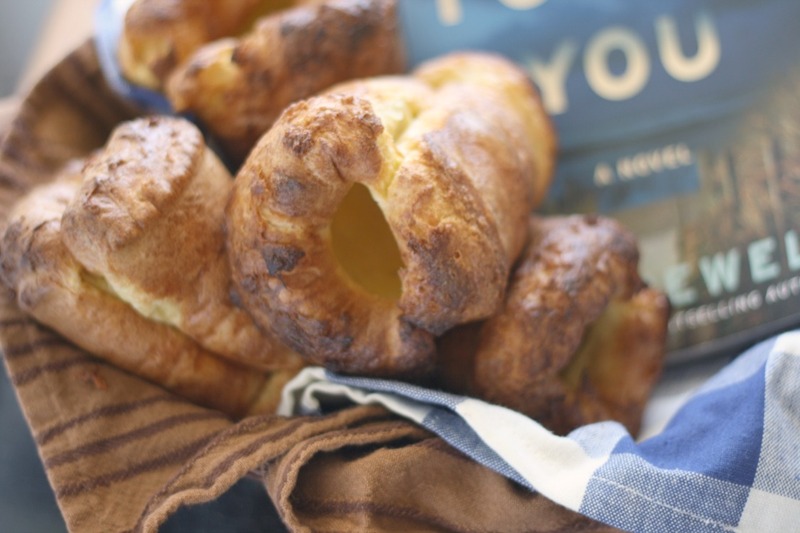 Oooh I saw these in Nigella's cookbooks and couldn't tear my eyes away from the photos. Yours are as equally stunning and drool-worthy! And you actually make it look so easy! Mmmm bar nuts. Those little babies are addictive and are the perfect midnight munchies cure. It sounds like you are going to be quite busy, but I'm sure you will manage to juggle everything and get into a routine. Good luck to your boys! I was just looking for a nut recipe!! That looks delicious. Hope that you get time to catch your breath and enjoy some football. I am still trying to get over the Cincinnati Bengals on Sunday and I don't have to worry about my college (Hillsdale College in Michigan) cause last time I checked they have never played one game on TV!! Have a great week. Congrats. I am off to Foodista. I can picture myself enjoying these before a game. Oh god, spiced nuts! Manna from heaven! I'd eat myself sick if I had a bowl of those! I'm invited to the party, right? hehe...Great party/snack idea. Though, you may have to keep me away because I tend to munch on snackies all day long. These look fabulous ... and you don't seem to be slowing down at all with your posting and reading! Oh...this is just up my alley. I've been a slacker with Nigella lately but I am cooking myself through the Nigella Express cookbook. I'll have to check out that site you mentioned! Ooooh....thank you so much for these great little snackers. I'm sure all the football fans that I end up serving will LOVE them. 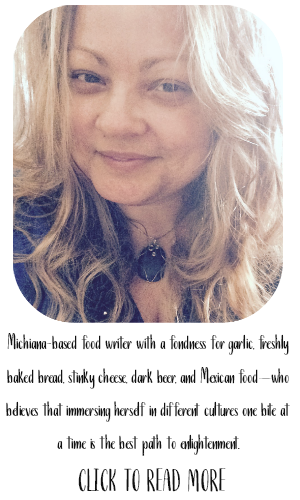 And...Congrats on being the Foodista Featured Blog today...CHEERS! Great post. I hope you will join me for Crock Pot Wednesdays on diningwithdebbie.blogspot.com. What delicious snacks!! Perfect for me when I'm movie watching! And congrats on Foodista!! Very cool! I know what you mean about Football season. My son is in the marching bad, and I'm a roadie, plus I work the booster booth at home games. No time for visiting, it's difficult. Very classy snacks, my dear! Love them. Do know some ND grads and some students there now. Do now do not know who to root for. Oh! I am told I am rooting for U of MN's Gophers. Duh! You've inspired me to go munch! Love the new snack ideas. Classics with a grown up twist! YAAAY HEATHER! GO you for making the featured blog! Totally deserve it, girl! Oh, and those nuts...oh my, oh my...are they chanting my name? Yes they are, here I come....!! Both snacks look amazing! Growing up in ND country, I am soooo over the Fighting Irish. For your sake I hope that they do well this season...except for on Sept. 26th when they face off against my beloved Boilermakers. I'll be at that game in W. Lafayette. You don't happen to work away games, do you? 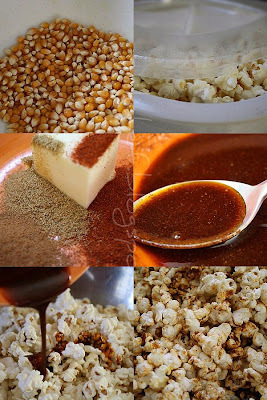 This looks so good, we make popcorn several times a week, but usually with just olive oil and salt, we will have to do this for a treat, delicious! Congratulations on the well deserved recognition you've received. I love today's recipe.I found it a while in Nigella's first book and made them to compare with Ina's. They are both nice. These would be super in (at) any bowl!!! You've taken nuts and popcorn to whole other level. Absolutely gourmet all the way. Enjoy football season. Congratulations on being Foodista Featured Blog of the Day. That's fabulous news. You deserve the recognition. These would be perfect snacks for game day! My family would especially like the nuts! Sounds delish.... unfortunately I can't eat nuts or popcorn since my latest health issue...(yes I'm bitching)....but have no fear... I will try these the next time we have guests...Thanks for the recipes! Our cooking club meets this Saturday evening and for the first time our theme is A Gourmet Tailgate-I have to prepare dessert. If anyone has any ideas. Please share. Love this post! College football is a big deal in our family too. We are part of the Gator Nation-University of Florida and we are matching up this weekend with the Tennessee Volunteers. It's going to be a fun weekend. Nice, I bet those nuts are awesome! This is a great idea! Love the spices! Both snacks look like they'd be gobbled up in seconds! 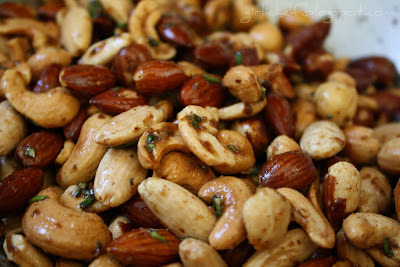 Love the rosemary on the nuts - yum! my kids would love to have this snack! sure gonna give a try! We went to MSU! Grew up near Norte Dame. Go State! But glad you are working for our near neighbor. Check out my blog if you get a chance - mentioned you for a previous comment you made. You are amazing! Nuts and popcorn look fantastic!! how simple yet so delicious! I love Nigella Lawson and I miss her shows. I think I fell in love with her after the first time watching her because of the way she describes food. It just makes everythings eem so much better. Both these snacks look delicious and simple. Oh and I heart that hunka butta with the spiceson and around it. Yum! YUM!!! I just need a handful of each and an ice cold beer!!!! Your photos are wonderful! I had seen this recipe and never tried it. 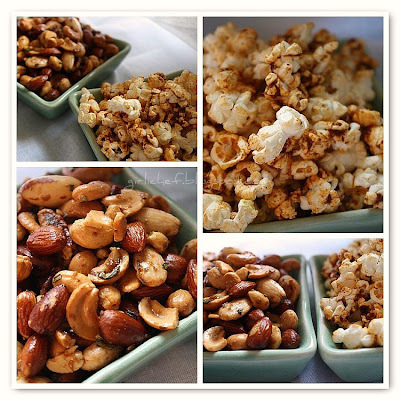 I think herbs with the nuts would be a perfect combinations- snacking for football games! 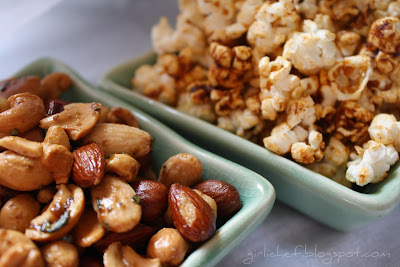 I love the way you made both the popcorn and the nuts! 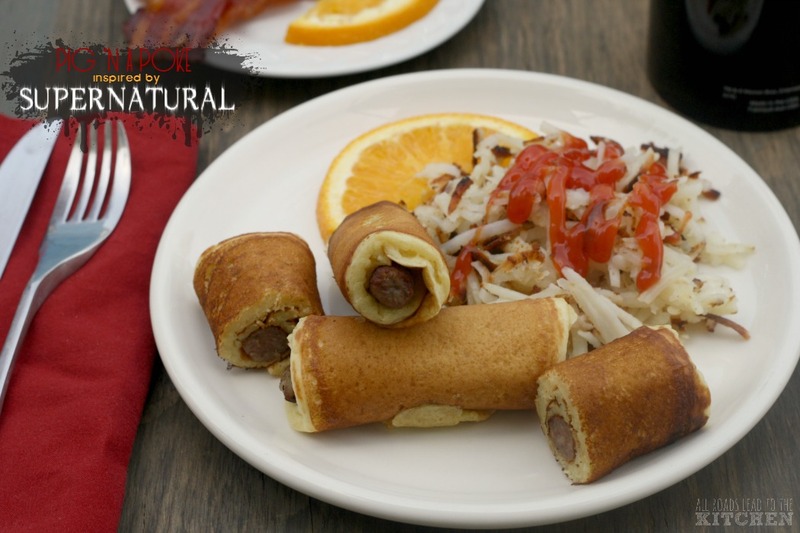 What a great combo to serve at a football party! My husband is a CRAZY Notre Dame Fan!! Oh, I forgot to say "Congrats" on being the Featured Blog on Foodista! 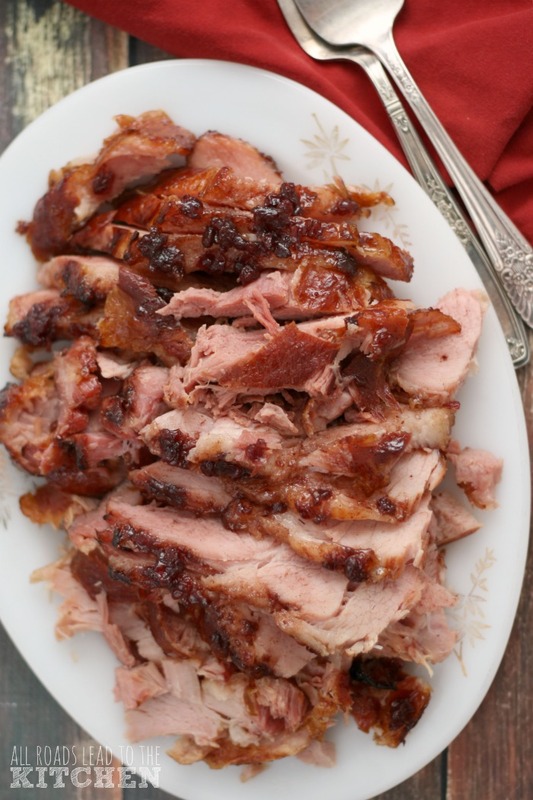 That was an awesome recipe and post! Another recipe I plan to make. LOL. Ciao ! What a wonderful recipe ! I just realize I should have written the recipe of my dish !!! 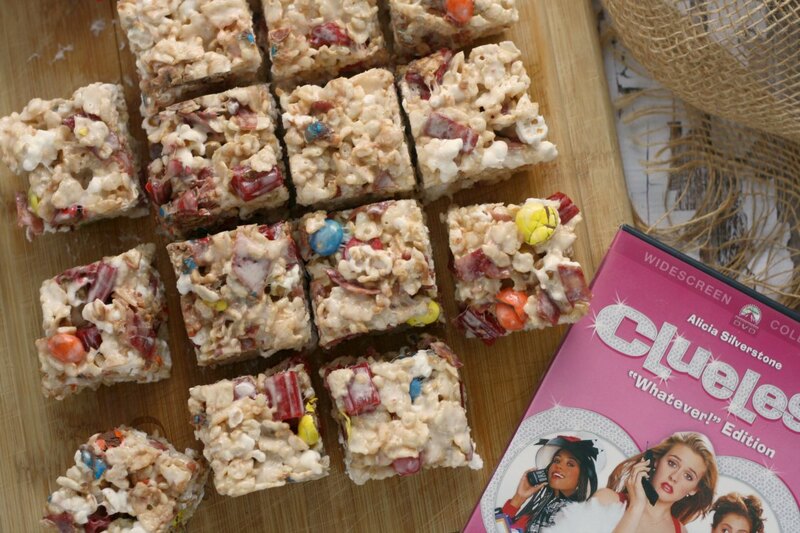 Hey, this one would be great for Monday Munchies or my Friday night parties! Yum! Yum!! I love nuts like that! They both look delicious! Perfect party food, indeed. Congrats on being the Featured Blog. Very cool! Ooh I love popcorn, I've put salt in it and cinnamon in it...not together. And not with cumin! Curious to try your recipe. And I didn't realize you worked for ND! My dad just to Chicago for a Bears/Chargers game and he stopped at ND and got me an Irish sweatshirt for Xmas! We always used to say I was going to go there when I was younger, we loved watching Rudy and my dad is half Irish so anything Ireland related my family likes. Lol.